Samsung Electronics announced today that it is expanding the transparent display market with production of a 46-inch transparent LCD panel, beginning this month. Samsungs 46-inch transparent LCD panel features a contrast ratio of 4,500:1 with HD (1,366x768) resolution and 70 percent color gamut. 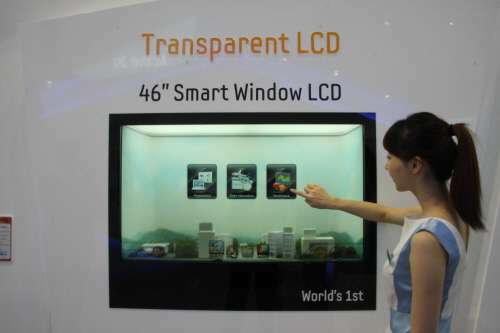 A 2012 CES Innovations Award honoree, Samsungs transparent LCD panel is being produced for a wide variety of retail display applications such as product showcases, commercial freezer doors and platform doors of subway stations in North America, Europe and Asia. Also, it will be used in other applications including e-boards, information windows, medical equipment, e-signage and mobile devices. 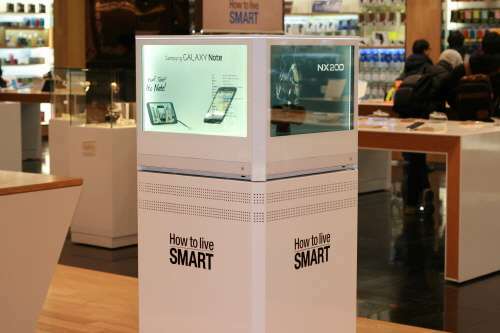 Samsungs 22-inch transparent LCD panel, which is now being commercialized, has been well received by customers and potential customers in the mobile devices, jewelry and luxury goods sectors due to its compact size and low power consumption, in addition to its attention-grabbing display qualities. 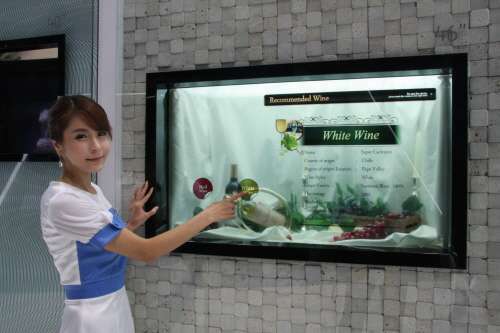 According to market research firm Display Bank, the transparent display market is expected to grow from US$0.9 billion in 2015 to US$87 billion in 2025. That's a game changer. Why buy a TV set, when you have windows? Because some color quality is lost due to transparency. Still, as stated above, this would be an especially cool feature for public transportation and other large traffic public areas. They have been using a small version of it on slot machines for a few years now. It is really eye catching. It will be most useful for referencing things in context, realtime. Because when I watch a movie I don't want to see the tree in front of my window in the background? For infomation and quick interaction purposes this is a very unobtrusive design. But for entertainment/immersion you need full opacity. Is the white color fully transparent or there is an alpha chanell? I mean is it RGB or RGBA? in the second video (0:21) you can clearly see that the white table is transparent. Imagine a white man in black jacket in front of black wall. LOL -> transparent head!!! Harry Potter - here we go ... !!! Could be nice for heads-up display in cars, or even a fold-down movie player in the back seat, which still allows the driver to see out the rear-view mirror. You could set up display cases with product info and pricing on the glass. For windows that double as a TV screen, you could have the outer layer made of self-opacifying glass. That's getting a bit pricy though. There's also still the option of a mechanical shutter or good old fashioned mini-blinds behind the screen.